Well no, not really. 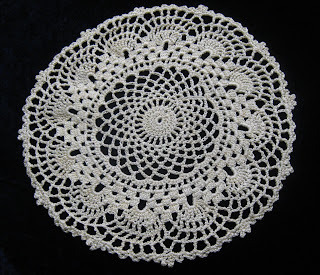 I am a sucker for helping people out, though, and when a friend told me her gran had lost a beloved doily when she moved to a nursing home, I couldn't help but say yes, really. Besides, I like a challenge and I had a whole set of steel hooks I'd never had occasion to use. The hooks had belonged to A's gran, or even to his great-gran, so I rather liked the symmetry of using them to make someone from the same generation happy. The pattern is Auriga, taken from CrochetPatty.com, and worked in Anchor Perle no.5 in cream. It was...certainly a challenge; the pattern was written somewhat differently than I'm used to and I didn't find the instructions for moving up a round very clear. But it sorted out in the end (despite much frogging!) and overall I'm really pleased with it. Off to the post office now - business at Seawood Designs is nicely brisk but not overwhelming, which is just right for how tired I'm feeling at the moment!